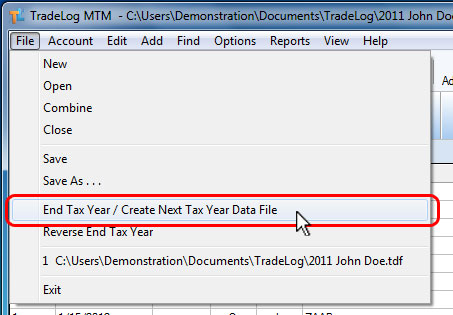 Automatically creates a new data file for the next tax year with the same name as the current tax year data file. For example, "2013 John Doe.tdf" would generate a file for the following year named "2014 John Doe.tdf". 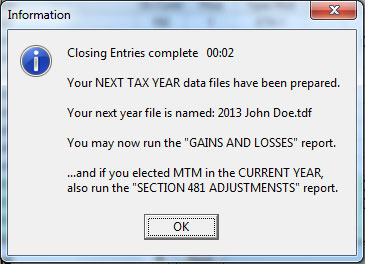 Moves forward all year end open positions from the current year data file into the new tax year data file. Moves forward all January and later trades imported for the following tax year from the current year data file into the new tax year data file. Generates wash sales and moves forward any wash sales that are deferred into the new tax years data file. NOTICE: You are required to complete the Year End Checklist for all accounts before you can End Tax Year. If you receive a warning that the Year End Checklist has not been completed, then please click here and follow the instructions provided for all accounts. Please see the lesson: End Tax Year in our Online Tutorial for a video discussion of how to use this function in TradeLog. TradeLog will prompt you to confirm that you have imported your January trades for all accounts. Make sure that you have imported a full 13 months worth of data prior to running this function (January 1 through January 31 of the next tax year). Click Yes if you have already done so or No if this needs to be done. TradeLog will tell you that the Next Tax Year data file has been prepared and the new name of this file. This new file will be located in the same folder as your current file - which is by default the Documents/tradelog folder of your hard drive.